Did Maxim Iglinskiy win Liège-Bastogne-Liège, or did Vincenzo Nibali lose it? The Italian rider did everything but win. He detonated the race with a double attack on the Côte de la Roche aux Faucons – first smashing the front group into pieces on the climb, then again over the top and into the descent. And for 15 of 20 kilometres, his lone escape looked like a victory procession: the boldest and strongest rider laying waste to his rivals’ ambitions. But Nibali would have been well-advised to heed the tactical plan the Astana team were concocting behind him. With three strong and in-form riders among the surviving dozen or so – Amstel winner Enrico Gasparotto, Robert Kiserlovski and Iglinskiy – their race wasn’t over. The group, mainly filled with race favourites and team leaders, was far too disparate, ambitious and disorganised to mount a coherent chase, so Astana got to work. The trio spent a few kilometres nagging and provoking the group with all three attacking in turn, until the group finally tired of it, and allowed Iglinskiy and Flèche Wallonne winner Joaquim Rodriguez (Katusha) up the road. Away from the momentum-sucking distraction of the rest of the group, Iglinskiy dealt with Rodriguez on the penultimate climb, the steep Côte de St Nicolas, then set about closing the gap to Nibali over the bumpy setts of the streets through Liège. The difference between the two riders was heartbreaking to watch. Iglinskiy’s gaze didn’t waver, his eyes fixed on the rider in lime green ahead of him, while Nibali’s focus intermittently switched between the road just ahead of his front wheel, occasional glances up, and increasingly frequent looks over his shoulder. His pedalling, so fluent after the Roche aux Faucons, was laboured. Who wasn’t on Nibali’s side, during those final kilometres? It was the classic battle between the underdog and the tyranny of sporting logic, between romance and gritty reality. Where better than the grimy, shabby suburbs of Liège to watch gritty reality prevail? Iglinskiy bore down on Nibali on the final climb in Ans, went past him, looked round once, and simply rode away from him. The Italian’s resistance had long since broken, and the race was lost. 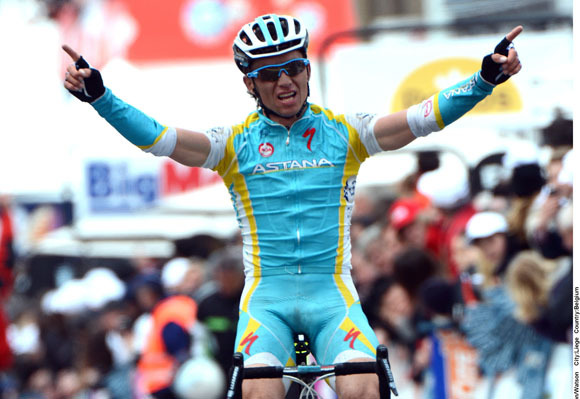 The Kazakh continued Astana’s astonishing run of success in the hilly Classics. Gasparotto won Amstel (with Iglinskiy 11th), Kiserlovski was fifth in Flèche (with Gasparotto and Iglinskiy 11th and 13th respectively. And with Gasparotto winning the sprint for third behind Iglinskiy and Nibali, they occupied two thirds of the podium in Liège. How are they doing it? The terrible weather, uninspiring environs of post-industrial Wallonia and the paucity of tactical enterprise shown by almost every team meant that this Liège-Bastogne-Liège was late in coming to life. Just as the only plan in Amstel seemed to be to control the race and wait for the Cauberg, and the only plan in Flèche seemed to be to control the race and wait for the Mur de Huy, the plan for Liège-Bastogne-Liège seemed to be to control the race and wait for La Redoute. The only surprising thing that really happened was that, actually, not much happened on La Redoute, save for BMC riding such a hard tempo that attacking was impossible. Route one tactics. The early break went, consisting of six optimistic souls: Dario Cataldo (Omega Pharma), Gregory Habeaux, Kevyn Ista (both Accent-Willems), Simon Geschke (Argos), Reinier Honig (Landbouwkrediet) and Alessandro Bazzana (Type 1). Their lead ballooned, then sagged. Behind, just a few teams showed imagination: Pierre Rolland attacked for Europcar, taking Vasil Kiryienka (Movistar) and David Le Lay (Saur), with 80 kilometres to race, taking another 10 kilometres to cross the two-minute gap to the leaders. Lotto, BMC, Katusha, RadioShack and Astana were happy to ride tempo, but with Rolland and Kiryienka defending from the front for their leaders Thomas Voeckler and Alejandro Valverde, at least not everybody was sleepwalking to the final climbs. Rolland, the winner at Alpe d’Huez in the Tour de France last year, was a dangerous rider to let up the road, and his attack demonstrated Europcar’s burgeoning confidence. Voeckler was eighth in the Tour of Flanders, fifth in Amstel and fourth in Flèche, and Europcar were the only team to try and engineer an advantage, rather than wait for a straight fight. What the television cameras don’t show in Liège-Bastogne-Liège is the slow erosion of the peloton from the back. As Lotto and BMC chased the leaders, the peloton shrank to around a hundred riders in the approach to La Redoute. Rain hammered down, and the bunch rode through the gloom to the base of La Redoute. BMC, with Tejay Van Garderen and Mauro Santambrogio leading the race in a single file through Sprimont all the way to the bottom of the Roche aux Faucons, were so strong that in hindsight, they might have been better off sitting back and saving all three riders for a less predictable finale. But nobody knew that at the time, and the early signs of real ambition were shown in the fight for Gilbert’s wheel before the climb: first Nibali, then Voeckler occupied the prime slot. Gilbert wasn’t going to win, that much was clear already, but the others weren’t yet bold enough to ride their own race. They were still planning their race around the defending champion. On the climb, Nibali’s pedalling looked so easy that the balance of power away from Gilbert and towards the Italian was perceptible. On the early slopes, Nibali kept looking at the others, as if he still didn’t know what to do. But about halfway up, he unleashed an attack that only Vanendert and Gilbert could follow, as Rolland’s adventure was finally ended. Nibali went again over the top, and carried his effort through onto the descent. Nibali was liberated – no longer looking to the others, he followed the motorbikes through the curves of the descent and engineered a lead of 15 seconds while his rivals dithered and recovered. The Italian had been a frustrated third at Milan-San Remo, having taken Simon Gerrans and Fabian Cancellara with him when he attacked on the Poggio. This time, he’d succeeded in attacking alone. It was as if a light had come on in his head, with the realisation that he was the strongest rider and the best descender, and that the win was there to be taken. And while Nibali rode with conviction, the group behind started turning on each other. Gilbert was isolated, and in no mood for doing the chasing anyway. Even when Iglinskiy and Rodriguez started the process of bridging, Nibali looked imperious. Over the Côte de St Nicolas, he still looked in control of his destiny. But Iglinskiy had already launched into a thrilling pursuit of the Italian through the streets of Liège, and one by one, he prised Nibali’s fingers from the winner’s trophy. The denouement was almost anticlimactic: Iglinskiy crossed the line alone, but he’d won the race the moment Nibali started looking backwards, not forwards.